Volatile organic compound (VOC)emissions play important eco- logical and physiolog ical roles for many organisms.Also fungi release alarge spectrum ofVOCs (Splivallo etal.,2011;Kramer and Abraham,2012 ).Fungal VOC emission sbelong toseveral chemical groups with different biochemi cal origins such as monoterpenes, sesquiterpenes, alcohols, aldehydes , aromatic compounds,esters,furans,hydrocarbons,ketones,aswell asnitrogen- and sulfur-con- taining compounds (Splivallo etal.,2007a;Campos etal.,2010;Kramer and Abraham ,2012 ). The measure ments inthis study were performed onthe mycelia ofnine fungal strains,four ofwhich belonged tothe EMgroup (Cenococcum geophilum Fries, Laccaria bicolor (Maire)P.D.Orton and the Paxillus involutus (Batsch)Fr.strains MAJ and NAU),three topathogens (Armillaria mellea (Vahl)P.Kumm., Pholiota squarrosa (Fries)Kummer and Verticillium longispor um (C.Stark)Karapapa,strain VL43)and two tosaprophy tes (Stropharia rugosoannulata Farlow exMurrill and Trichoderma viride Pers). Volatile compound swere collected inthe headspace from all fungi grown inglass Petri dishes (diameter10cm)containing 30mlofthe modiﬁedMelin-Nor krans synthetic medium described above.Each Petri dish was inoculated inthe center with asingle fungal plug (diameter1cm)and incubated at24 Cinpermanent darkness (exceptfor the short moment the cultures were taken tolight for measuring the diameter ofthe colonies).Control plates without fungal inocula were incubated under the same conditions.The fungal diameter was measured every six days. and ﬁnallyto300 Catarate of12 Cmin 1. ted byfungal species and their mycelium surface area atthe end of the growing period. 3.1.Fungal growth and ITS sequence. 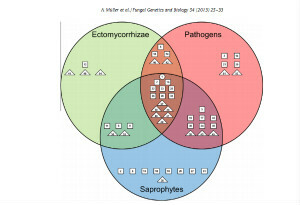 Agger,S.,Lopez-Gallego,F.,Schmidt-Dannert,C.,2009.Diversity ofsesquiterpene synthases inthe basidiomycete Coprinus cinereus .Mol.Microbiol.72,1181–1195. Bäck,J.,Aaltonen,H.,Hellén,H.,Kajos,M.,Patokoski,J.,Taipale,R.,Pumpanen,J.,Heinonsalo,J.,2010.Variable emissions ofmicrobial volatile organic compounds (MVOCs)from root-associated fungi isolated from Scotspine.Atmos.Environ.44,3651–3659.